Granular user & tool permissions allow administrators and managers to set repo access permissions for individual users as well as user groups that can be created to quickly change access permissions for a set of individuals in a space. To change permission settings for multiple users at once, create a user group for users that will be used often. For example, create one group for developers who often work on projects together or create a group for clients who should have only view access for the repos associated with their projects. To create a user group, open the Users Tool from the Portfolio screen. From the Groups sub-tab, click Create Group, enter the group name in the Save as textbox, and select the users (and groups) to be included in the new group. Select the Save button to ensure that the group is created. 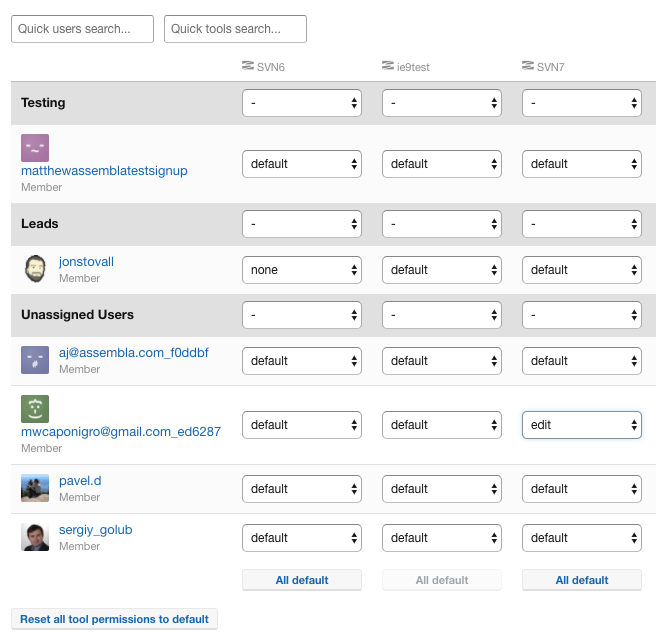 To view the individual user permissions, open the Team tool from your Space menu. Then, open the Tools permissions sub-tab. All of the applicable user groups in a Portfolio will be displayed on this page, with the users from that Space shown in their respective groups. All users without a group will be displayed at the bottom of the list under “Unassigned Users”. 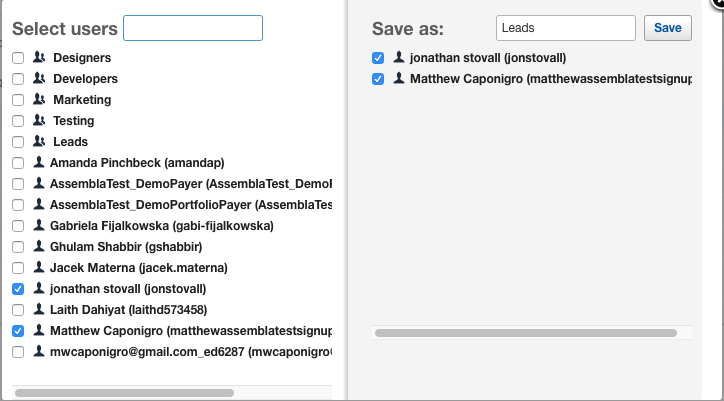 Permissions can be set for individual users, as well as user groups created at the Portfolio level. Note: Permissions can only be changed for members. Owners will retain their "all" permissions. User permissions can be set to default, none, edit, and all. “Default” gives the permissions associated with the user’s assigned role (Owner, Member, Watcher). “None” gives no permissions at all. To a user with “none” permissions, the associated tool will not even be visible in their menu. “View” gives read-only permissions. “Edit” gives the user write and read permissions. And finally, “all” gives write and read permissions as well as permissions to change settings and even delete the tool entirely. Tools and users can be filtered using the “Quick users search” and “Quick tools search” search bars at the top left of the screen.